The best desktop virtualization hardware in the business deserves an equally game-changing software management layer. That’s why we created DCO from the ground up to quickly and efficiently manage virtual desktops—and nothing else. With DCO, everything a desktop administrator needs for day-to-day management of your organization’s virtual desktops is aggregated into one secure, centralized console. DCO automatically backs up persistent pools upon creation enabling quick and seamless pool movement between Desktop Cloud Computing Appliances when needed for failover or scheduled maintenance. Sphere 3D’s Desktop Cloud Orchestrator® (DCO) provides a simple user-friendly interface for managing virtual desktop pools on Sphere 3D’s Desktop Cloud Computing Appliances. It was created to aggregate key features that a desktop administrator would need from VMware’s® View, vCenter, and vSphere into one centralized console, leaving out the items that a desktop administrator does not use. By deploying DCO along with Sphere 3D Desktop Cloud Computing Appliances, desktop administrators can quickly create, move, delete and manage desktop pools without requiring extensive knowledge of a VMware environment, thus freeing up senior IT staff to work on more complicated projects. In addition to offering flexible pool creation and management, DCO provides policy-based pool movement administration for failover. 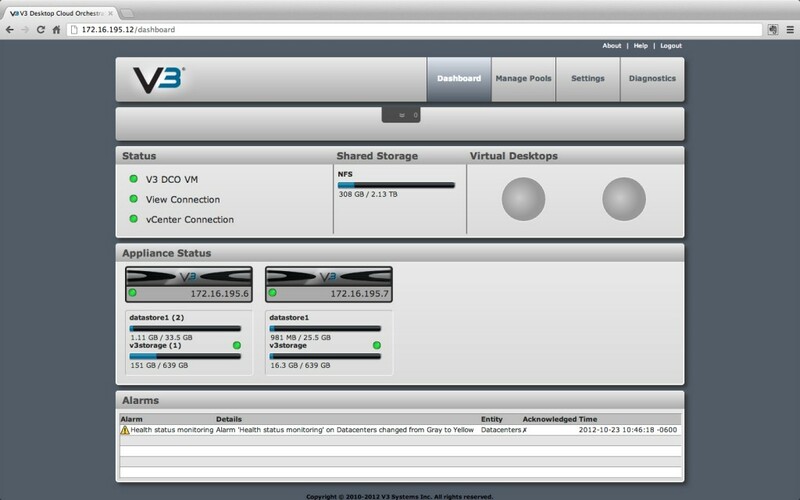 Dashboard – The dashboard provides status information about the Desktop Cloud Infrastructure, available space on shared storage, virtual desktop usage, Sphere 3D Appliance status showing available space on local storage, vSphere alarm alerts within the last 8 hours, and a pull-down Information Panel that shows critical stats and other information at-a-glance, including a list of currently running processes. Pool Movement – DCO is equipped with Optimized Desktop Allocation (ODA), which enables pool movement from one Sphere 3D Appliance to another across a LAN or WAN. Pool Management – The pool management features allow users to: create pool, delete pool, enable pool, disable pool, add entitlements for groups/users, remove entitlements for groups/users, move pool from appliance to appliance, refresh pool, recompose pool and edit pool. In addition, it allows you to perform VM management including assign user, un-assign user, refresh VM and various VM power operations. Diagnostics – Provides the capability to view information about Sphere 3D Desktop Cloud Computing Appliances (including BIOS, processor and memory information, along with temperature, power and fan status) and information about select appliance storage devices (including product name and serial number, firmware version, storage capacity, attachment state, health percentage, lifetime read and write volume, port on EID interface, and more). Diagnostics also provides the ability to download the Sphere 3D DCO log file, which includes relevant logs that are helpful for diagnostics such as Apache logs, boot messages and system logs. Saves Money and Time – The learning curve for DCO is minimal, which results in saving time and money that would otherwise be spent on having to learn an array of new products and applications. 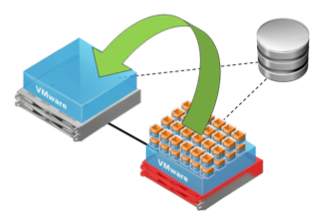 DCO aggregates key VMware features into one common user-friendly interface providing the ability to manage thousands of virtual desktops without having to become an expert on VMware products. Fast Failover/Pool Movement – While vMotion was originally created for server failover, DCO uses Sphere 3D’s patent pending Optimized Desktop Allocation technology to move pools from one Appliance to another.